12" wide nozzle & free standing tripod. Fitting on the head will accept 4" hose (not included). Very sturdy. Seems like it will hold up for years. Base heavy enough to hold it firmly on the floor even if using a stiff hose. Definitely worth the money. - Fortunate to have a large shop floor that I recently covered with plywood. Bought this in hopes of making cleanup faster and easier. Used it for the first time and really like it! - Ordered it online, standard shipping, and it arrived 24 hours, 11 minutes after hitting the submit button for my order - incredible!! It's true, I do live just down I-5 a few hours south of the warehouse, but still...that's terrific for expedited shipping much less standard shipping! 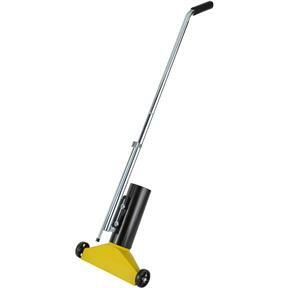 - The floor sweep was easy to use, rolled smoothly, felt solid, nice handle grip. It sits about 5/8" of the floor. The sweep housing is coated metal which, if my pictures upload, you can see has some finish issues. No big deal to me, but maybe someone else feels differently. I connected it to a Clear Vue cyclone dust collector (1800 CFMs), it did a fantastic job picking up sawdust and chips off both the plywood and my floor mats. It also had no trouble picking up some shavings - I was worried they'd simply get pushed along by the front of the floor sweep since it sits so close to the floor. I attempted to reconfigure the floor sweep to work with my shop vac but didn't have the correct 2" to 4" connector - again, stymied by the crazy sizing disparities of the dust collection manufactures. 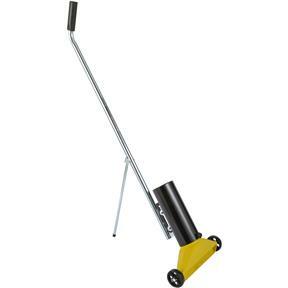 It will be interesting to see how well it works with a smaller vac. - It comes with a stand that folds out which essentially makes a tripod - I don't see myself using that feature since it takes up a lot of area in that configuration. [If the picture of the deployed storage stand uploads I just want to mentioned that the handle appears to be upside down, but this is ONLY when it's in this stored configuration. In use, the handle is ergonomically correct.] My floor sweep is propped up against the side of a cabinet and seems to stay put - perfect! The cotter pins that hold the wheels on keep falling out. Otherwise, it's okay, but I don't think it was necessary.